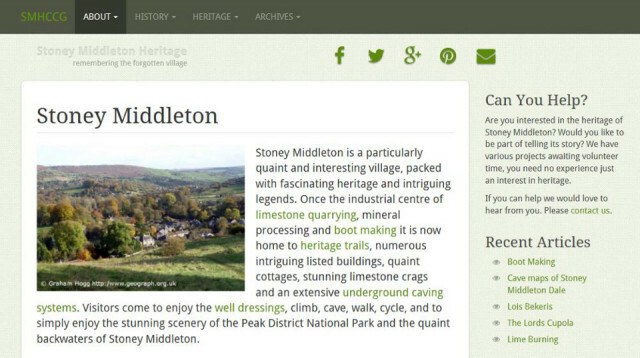 New website for the heritage village of Stoney Middleton following Heritage Lottery Grant. 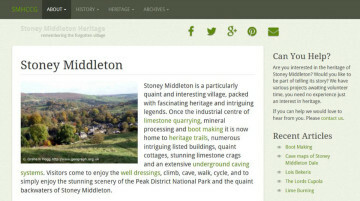 Stoney Middleton Heritage Group has this week announced the launch of its new heritage website. The site has been specifically designed for the group to provide an easy, clear usable platform to showcase its growing archive of information, pictures, documents, and audio recordings which will continue to grow with time as material becomes available. Stoney Middleton is a village of outstanding interest and importance for its rich and diverse heritage, customs and legends. The reason why it was awarded over £30,000 from the Heritage Lottery Fund to preserve and portray it to a wider audience. A spokesmen for the group said they wanted to thank all the all volunteers for the hard work and commitment to the project. The website is just one of a number of exciting outcomes to be rolled out over the next few months. The site can be viewed at smhccg.org.